In the beginning of 2018, the TU Delft presented a new strategic framework for the coming years: the Strategic Framework 2018-2024. This Strategic Framework serves as a high-level compass for TU Delft, and provides guidelines for the myriad decisions, both big and small, that are taken in every part and level of the University. Below you find the strategy in a picture. By clicking on the blue dots you can find out more about the different elements of the strategy: Students & Education, Research & Innovation, People & Community and Campus & Services. 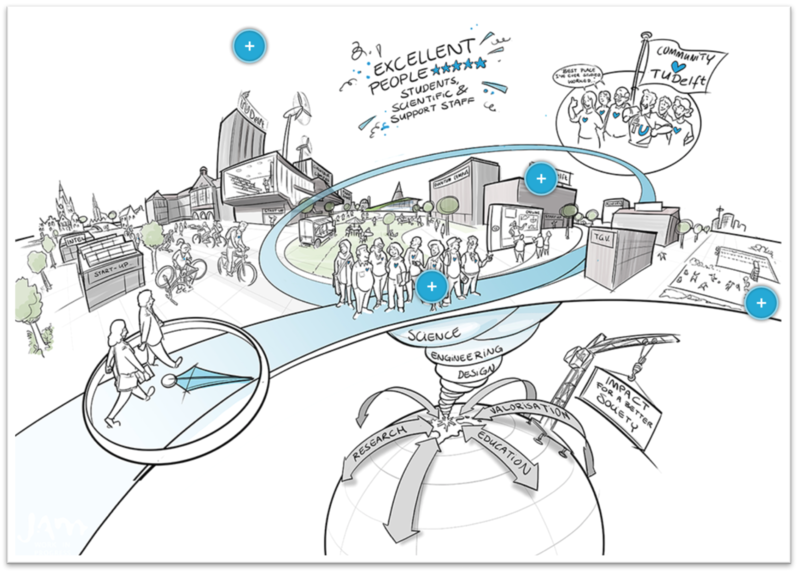 In this online document you will also find the TU Delft Vision, Mission and Values. In the near future we hope to add updates on what we together have accomplished. in English (click here) or in Dutch (click here).